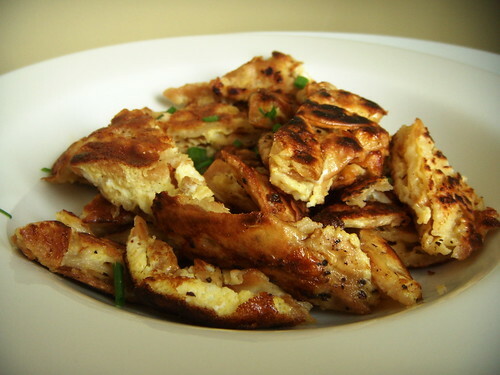 crispy and tender table water cracker matzah brie, originally uploaded by aarn! +12th October, 2008+. a spin on a favorite childhood breakfast. took half of a log of carr's cracked pepper table water crackers and soaked them in room temperature water in mixing bowl, used a small bread and butter plate as a weight to keep the crackers from floating. after about 5-minutes they looked pretty soggy, so the water was drained from the bowl and the small plate was used as a press to ring the remaining water out of the crackers. two beaten eggs were whipped with a little canola oil, salt, pepper, and a splash of buttermilk, and poured over the soggy crackers in the bowl. the egg mixture was soaked up by the crackers after a few minutes, then the whole mess was carefully slid out of the bowl into a frying pan with hot canola oil, making sure to keep the crackers layered even and flat. the lasagna of eggs and soggy crackers was simmered on low heat, covered, until the bottom was crispy and then flipped, and cooked until the layers seemed to all be connected and all of the egg binder felt cooked. then, while still in the pan, the large pancake of mess was chopped into a bunch of little randomly sized pieces with the end of a spatula, the heat was raised and the brie was crisped uncovered until the edges were flaky. topped with some fresh cut chives, this one could have knocked mom's out of the running. kinda reminds me of the time you microwaved crackers and cheese at my house one grand old day.